The Dragonslayer! The Wild Man in the woods. Ogun clears the forest. He is the Architect, the Builder of Civilizations. Ogun is the Father of Technology; because of Him we have the automobile, the airplane, and the computer. Ogun is the strong, silent type; thick of body and brief in His speech. He is the blacksmith, the toolmaker, and a tireless worker. Ogun carries the weight of the world on his shoulders. The person who is willing to work hard can turn to Ogun for employment and be well paid. As the god of Iron, Ogun is covered in a metal-like substance. 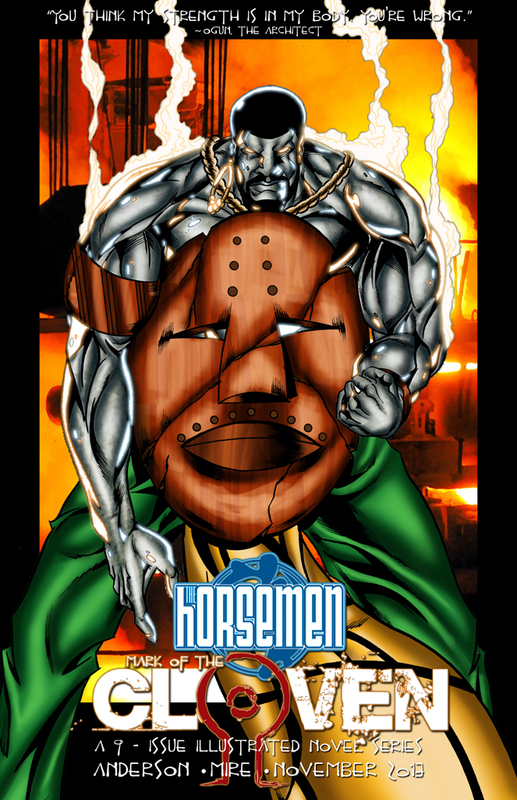 This allows Ogun to have immense strength and makes him nearly invulnerable to harm. In addition, Ogun has complete mastery over ferrous materials and can work this element much in the same way Obatala can work flesh. Furthermore, Ogun’s analytical thinking is superhuman allowing him to create or operate any device or sense any structural weakness. In other words, Ogun can create…or destroy anything he puts his mind to. i made a better version of Ogun,Shango,Oshoosi,they made of wood and plaster.